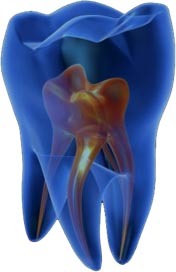 Endodontics, a primary care that precedes the placing of a dental prosthesis. Our dental surgeons work with the help of binocular loupes and under drapes to improve the reliability and sustainability of treatments. Endodontic treatment consists of treating a dental root. The objective of Ardentys is to preserve the pulp entirely. the treatment of the root is only done as a last resort. Thus, it is only performed when the tooth cannot be kept alive. Either because it is already necrotic or it may become so. At our clinic, we use a mechanized technic (ENDO MATE) in order to simplify the treatment procedures as well as improving the patient’s comfort. Under local anesthesia, the dentist creates an opening within the occlusal surface of the tooth and gains access to the pulp and eliminates it. With the help of limes and antiseptic solution,the dentist cleans and disinfects the pulp canals. then, after drying, he seals the roots with a specific paste.. When an initial Endodontic treatment appears to be inadequate or has failed. Then the tooth should be retreated by removing any root filling material. By cleaning again, shaping, and sealing the root canals. On a crowned tooth, the prosthesis must be deposited.